I just wanted to write and tell you I am having so much fun on my health journey. I came to your program in North Carolina in October. I have already lost 40 pounds and I am told I look like a different person. I’ve gone down several sizes in clothing and feel so much better. The improving changes starting happening immediately. I started getting comments as soon as I got back from your program and they haven’t stopped yet. My blood work has all improved and I no longer have insulin resistance. My skin has improved dramatically – I get lots of compliments on my complexion now. I have a lot more energy (that was my biggest complaint when I came to your program). I’ve had carpel tunnel for about three years and I noticed after just two weeks it was gone. My migraines have improved a lot. I also just realized how much stronger my immune system must be. I have not been sick or even had a cold since I started this journey. I am a mother of six children and I am exposed to a lot of germs! I could go on and on about the health and beauty improvements I have received. I had my first blood-work done just four weeks after starting the program. The two biggest changes I saw were in my insulin and ALT (liver function). My insulin was 10.7 which helped diagnose me with insulin resistance (metabolic syndrome). That number should be below 5 but ideally you want it below 3. Mine came back below 2. Yea!! My ALT was at 44 and the normal range is 0 – 40. Mine came back at 32. Awesome!! My doctor was amazed at what I had done in just one month. I was also down 20 pounds at that time. My doctor wanted more information about your program and she completely agreed with everything. It makes me excited to go to the doctor now. I have done every diet there is out there and they have all been such a struggle for me and obviously, have gotten me nowhere. Your program has not been hard at all and I don’t feel like I have been deprived of anything. 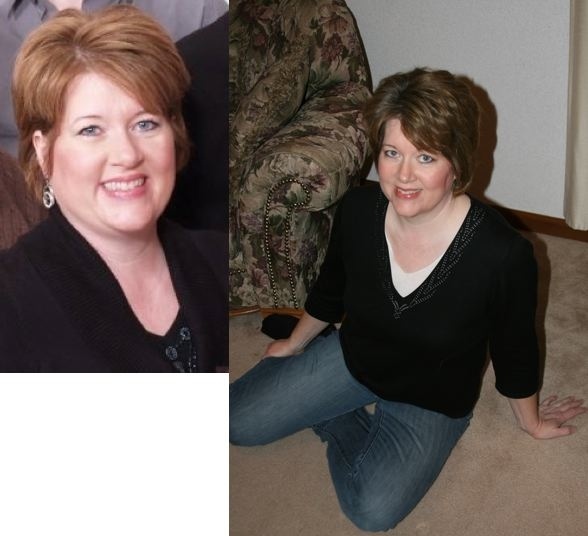 It has been a lifestyle change for me that has been very positive and very, very doable. I was worried when I signed up for your program about a couple things. First of all, not knowing anyone else going. I was a little nervous about going by myself but the very first night all my worries were gone. We started getting to know each other right away and it ended up being a very casual and comfortable atmosphere. I still stay in touch with some of the people I met even though we’re from all over the United States. The second thing was not really being sure about the food you were going to serve. I am a very picky eater and I just thought I probably wouldn’t like the food. I was so wrong! The food was fabulous and definitely not your regular “diet” food. It was so rich and wonderful! I couldn’t believe we could eat these things! I began thinking there was no way I was going to lose any weight eating like this. I was wrong again. When I got home I had lost eight pounds which was really incredible for me because I really believed there was no way I could lose weight (especially eating this food). While I was at the program, I noticed within the first couple days I wasn’t always hungry when it was time to eat. This way of eating was much more satisfying and took me longer. I wasn’t craving more food and didn’t feel like I needed second helpings. One night you made that wonderful lava cake and, oh, I thought I could eat the whole thing. I ate a small serving of it and was completely satisfied and didn’t feel like I had to eat more. I feel like I am much more in tune with my body now. I was a little overwhelmed by the amount of teaching you did. I took notes like crazy. I learned so much and I still pull my notebook out at times. You talked about how important our sleep was to our health. I came home and made that a priority. I sleep so much better now and actually feel well rested in the morning. I know it’s made a big difference in my health. I’m more productive during the day and don’t feel like I have to lie down in the afternoon like I did before. On my drive home I didn’t feel the need to stop and get the junk I normally would have gotten before when traveling, like soda, candy and fast food. I had my bottled water and stopped for a Subway salad and I was happy. These places weren’t calling my name like they did before. I could also tell on my drive home that my head was clearer, I could think better, I had more energy and I was more calm. I drove straight through – 11 ½ hours. I couldn’t believe I could notice a difference in this short of time. I am so thankful I was able to attend your program and have the hands-on learning experience. I think that’s what really made it click for me. Do you know what has been so fun for me? All the comments (or I should say compliments) I get from people. I hear, “oh my gosh, what have you done?” everywhere I go. I’ve been told I look like I’m in my twenty’s. (I love that since I am in my 40’s.) I’ve been asked, “are you the mom?” I have people calling, emailing coming up to me at different events asking me how they can do this too. The first question most people ask is, “is it hard to do?” Besides comments on my weight, I also get lots of comments on my skin. I have always had problems with acne and the products I thought I had to use always dried me out majorly leaving my skin looking awful. I just thought that’s what I had to do for the rest of my life. My skin has changed so much I can’t even believe it. When I hear these comments it makes me realize that I have really been transformed – totally. What a perfect name for your program! I have also enjoyed listening to your radio show. It’s a weekly dose of encouragement for me. I always look forward to it. I especially enjoyed the shows before the holidays. They really helped me get through all our holiday events. The gift giving ideas were wonderful too. I was able to breeze through the holidays losing weight – absolutely no set-backs at all. It was awesome! I was in a lot of situations where before I would have overeaten and indulged in a lot of sugar. This year I was calm and had no desire to dive into the cookies and desserts that I would have before. I just want to thank you for sharing your knowledge and your own experience with us. It has been an amazing journey for me so far (and I’m not done yet) and I am so thankful for the work you have done.